Natto Day is an unofficial holiday celebrated by Japanese cuisine lovers around the world. It is dedicated to a traditional Japanese food made from fermented soybeans that is especially popular in the eastern regions of Japan. Natto is a protein-rich food made from natto soybeans fermented with the hay bacillus (Bacillus subtilis var. natto). First, the beans are washed, soaked in water, and steamed or cooked in a pressure cooker. The prepared beans are mixed with the hay bacillus and fermented at 40 °C (104 °F) for up to 24 hours. Afterwards, the mixture is cooled and left in a refrigerator for up to one week. Natto has a distinctive and powerful odor that reminds of certain pungent cheeses. During fermentation, some of the protein contained in the beans breaks down to amino acids, which results in a slimy texture with sticky strings. It is often served as a breakfast food with rice, Japanese bunching onion, karashi mustard, daikon and soy sauce. 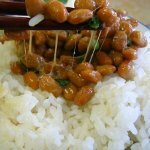 Natto is also used in other foods, such as miso soup, salad, sushi, okonomiyaki, and even ice cream. Natto Day in Japan is celebrated on July 10 because the numbers 7 and 10 sound similar to “natto” in Japanese. However, you shouldn’t think that it is celebrated by all Japanese: due to natto’s specific smell, flavor and texture, it is an acquired taste just like French blue cheeses, British Marmite, Australian Vegemite or Scandinavian lutefisk.